A Baabaa darted out of the old barn screaming for dear life. Its bleating screech pierced the ears of a Usul nearby. "What's the matter?" she said as the Baabaa slowed down to a wobble. The Usul's green ruff scraped against the petpet's blue wool as she bent down to pet it. "Come on, Wooly, you really do make such a big fuss sometimes." "Wooly" was the name of this and all other Baabaas at the farm. He lowered his head, letting the girl's paw gently trail down its muzzle. He gave his head a few shakes, ignoring the question entirely. Sally sighed as Wooly stood doing... whatever Baabaas did, she supposed. Their beady little eyes never did show much intelligence, though she supposed that Baabaas must have been smart, somehow; otherwise, why would people use them to count? She took a few steps back toward the barn. The specter of night was just beginning to envelop the sky, and it wasn't safe to keep Baabaas out in the open right now. Sally didn't exactly know why. "Okay, come on," she said softly, inching closer to the wind-weathered building. Her hand reached into the sack hanging around her neck to procure a carrot that instantly produced little ruffles on Wooly's nose. A sudden screech—not Wooly’s—lay ruin to her train of thought. Instinctively, Sally's head turned toward the source of the noise: the old barn. Near its entrance, a lanky figure crawled about on all fours clumsily, and Sally wondered if it should have been walking on two legs instead. Two wings protruded from the creature's back; one bent laterally like a broken finger. It locked its gaze onto Sally and Wooly with eyes that may as well have been two yellow stars in the darkness. Wooly screamed again. This time, however, rather than run away, it simply hid behind Sally, who stood mesmerized by the creature, trying to remember if she had seen something like it before. She searched for adjectives that might have described it. "Well, okay," she whispered to Wooly, "is that what you were screaming about?" Wooly didn't reply because he was too busy trembling in fear. As much as a Baabaa was wont to tremble, anyhow. The creature eyed Sally and "her" Baabaa for a few more moments. Sally bit her lip and clutched a patch of Wooly's wool, her eyes widened beneath her red fringes. Just when Sally was about to to yell for help, a flap of the creature's healthy wing took the air out of her breath. It whisked itself into the barn before she could blink. What a strange, scary thing, thought Sally. It wasn't supposed to be here--but it wasn't like anything else that wasn't supposed to be here. It wasn't a Crokabek, a Doglefox, or even a Spyven. It was something different. And so, rather than run away and scream to her parents like many other children did before her, she said to no one in particular: "I wonder why Wooly was so afraid of it. It didn't hurt me... though... I guess that scary thing is just a little scary." As if it had understood any of that, the Baabaa let out a single defeated bleat that couldn't have possibly contained any meaning. "Oh, I think I know what you're saying," she said. "Did you think it was trying to eat you? That's rude." Nothing should have been trying to eat a cute thing like Wooly. Its eyes contained a limpid stupidity to them, and its ears a keen dullness. It personified innocence, or something like it; nothing could have possibly had the heart to rid the world of it. Unless it was really hungry. That was it! The scary thing was just ravenous. How did she not realize that a gangly creature could have possibly been hungry? With a spark of an idea in her head and some edible foodstuffs in her pack, Sally headed toward the barn, unburdened with the faculty of wisdom. The first issue she ran into was how to address it; the thing did not have a name that she was aware of at all. Not that Sally knew much of any nomenclature. Responding to this greeting, something stirred. The outline of the creature's head was barely visible in the back of the barn. "Scary! Mister Scary!" exclaimed Sally, blurting out the first adjective that came to mind. "Mr. Scary... um... hi. You seem pretty hungry, so I am leaving food for you." Sally slowly bent down, lifted the makeshift strap away from her neck, and dumped the contents of the sack on the ground. A small, colorful pack of berries and nuts formed a pile near her feet. As it turns out, Mr. Scary was very hungry indeed. When Sally returned to the old barn, she had found that her sizable pile of food had disappeared. A thick, jagged set of claws had also torn through a few pumpkins from a nearby patch, leaving them cracked and hollowed-out. The creature peeked out at Sally behind a shadow cast by a bundle of farm tools. Sally peered back with a weak smile, which prompted it to sulk back again. Sally ran back to her house and grabbed a few stray fruits and vegetables that nobody would miss. She dropped them off in front of the barn, just as she had the day before. Before walking away, however, she watched the creature's shadow slowly disassociate from the other shadows in the barn. It was a good harvest this year; at least, it was a good harvest for some people. At the dinner table Sally's parents spoke of some... thing that marauded through farms and left behind a massacre of crops in its wake. In fact, a small team of their neighbors had put their minds to hunting this agricultural menace, and they would not stop until they had its head. "Or until they become bored with the whole thing," Sally's mom added with a laugh. "People think of the darndest stories sometimes." Sally nodded along and scooped up some corn into her mouth. Her mother prepared their breakfasts, lunches, and dinners every day, and in her opinion, they were the best meals ever. Perhaps this was why everyone yearned for the meals their mothers made. But it did make her sad, in a way. She'd only cobbled together the barest of essentials for Mr. Scary, reject morsels and bits of stalks deemed unfit for people. So she brought him something edible. Well, maybe the word "edible" might have been a stretch. Sally only knew how to make sandwiches and doughy bread, so that was exactly what she'd brought to Mr. Scary. The outline of Mr. Scary's head appeared from somewhere inside the barn. The fluttering sound of a Crokabek's wings rushed past her ears. Slowly, Mr. Scary crawled toward the entrance, stopping only until the sunlight grazed one of his gauzy paws. His eyes, still two specks of yellow against the darkness, locked directly onto Sally. Sally stayed where she was. She slowly lowered her haphazard platter of hot dough mixed with vegetables and nuts, stopping only to consider what, if anything, she'd say to Mr. Scary. "... Be sure to eat your food, young man," she said. She didn't really know if Mr. Scary was old or young, but it felt like an appropriate thing to say. Mr. Scary hissed in response; Sally took the hint and left him alone, walking again past some nibbled-on pumpkins. While making the trek back to her house to continue with her duties, she put her hands over a rumbling stomach. It was time for lunch. Lunch! She ate three meals a day--breakfast, lunch, and dinner, sometimes with a snack in-between, and yet she had only given Mr. Scary one meal. That paltry amount of food would never satiate her, and she wasn't even starving. Sally came home to find her mother stirring something in a pot. The steam carried the tantalizing scent of pea-and-carrot soup, with a nice, creamy broth as its base. "You're just in time," Sally's mother said with a flick of her tawny pixie hair, "it's just about ready. How much do you want?" "Well... actually," said Sally, "I want two bowls today." Her mother raised her brows, inclining her head toward the remnants of dough and vegetable juice resulting from Sally's culinary efforts. "Really? Well, you must be feeling hungry." Sally nodded. "Well, that, and I need some food for Fluffy. He's right out in the barn." "Fluffy, huh?" Sally's mom smiled weakly. "Well, all right, then, I'll make two bowls for you. How about you come here and clean up your little mess while you wait, hm?" "Yes, ma'am," replied Sally. She grabbed a rag and started wiping down the wooden counter. "So, how have you been getting along with the other kids?" "Good," Sally said, picking at a particularly stubborn bead of dough. "They're doing well." Before her mother could push the subject further, a knock on the door grabbed her attention. Unable to leave her stew when it was so close to completion, she bid Sally to answer it. The visitor was a red Lupe with perpetually squinted eyes that still somehow managed to protrude from their sockets. His eyebrows sat atop them like two stacks of hay. "Hello, Mr. Pomiculture," she said. "What brings you here today? Mom made some soup, if you want any..."
Mr. Pomiculture sniffed. "Is your papa home, girl?" "I... well, no. He travelled to Havister last week, he--"
A sudden interjection saved Sally from her awkward, bumbling explanation: "Yes, Mr. Pomiculture, what do you need from us?" the stern voice of her mother rang clear. "Is this about your little hunting expedition?" Mr. Pomiculture gave a grunt in response. "I thought so. Listen, do what you want to do, but please stop tryin' to rope us all into this. I don't have the patience for your colorful imagination--just invest a little in pest control, and be on your way, all right?" Without a word, the old Lupe left. Sally turned to her mother to find her towering behind her, balancing a bowl in each hand. The staid look on her face vanished, replaced with a smile as warn as the creamy pea-and-carrot soup. "I got your soup for you," she said. "Well, you, and this ‘Fluffy’ fellow. Tell him I said hello." Mr. Scary seemed happy with three meals a day. At least, that was the conclusion Sally reached when she noticed he'd stopped nibbling on the pumpkins; any pumpkin desecration from here on out was mostly the Crokabeks’ fault, who had now decorated the scarecrow with mistletoes and berries for the upcoming season. Sally would often request two portions of her meals to share with Mr. Scary. She left one portion out for him at the barn and ducked out of the way as Mr. Scary reached to eat it. He never came out in her presence, but that was okay. Mr. Scary was just a very shy sort of guy, decided Sally. They had that much in common, and besides, anybody would be shy if they were so ragged and thin. Mr. Scary did listen well. At least, he never interrupted her or told Sally that her topics of conversation were dumb. "You know, Mr. Scary," she told him on a frostbitten afternoon, "Mr. Pomiculture is really trying to find the Thing he was talking about. I suppose he's always trying to find it, but I think he's getting a little angry. What I don't understand is, why is he getting so worked up about finding something that he probably won't be so happy about finding? "You know, I think I get frustrated when I lose something too, and I can't find it, but I don't think I understand why he's so upset." Sally shrugged and stretched her neck back so her head hit the old barn's walls. "Have you ever lost anything, Mr. Scary?" "I know you're kind of quiet. You've got to be so bored though, in there. Maybe once you get better and grow, we can go to the market together. They sell so many things there. Like those little plush dolls. I have a collection of them, and they're all pretty cuddly." Mr. Scary hissed as he finished off the last remaining bits of his meal. Sally waited until his shadow retreated back into the barn before she returned to the house. Her father had come back to the dinner table after his several-hour trek to the market. Winters were always slow, always quiet, and this one followed the trend. But there existed various different sorts of quiet. First, there was the calm, peaceful quiet, the one where everybody went about their business, perhaps exchanging local gossip or trying to make interesting trinkets with whatever junk they had on hand. Then there was the sort of quiet that was lonely, the kind where you trudged along on summer days without anybody to keep you company. This quiet fell into neither category. This quiet was creeping, uneasy. Trepidation hung in the air like a fog, permeating every conversation and every action that her parents took. Something was brewing, but whenever Sally asked what the matter was, she'd receive a dismissive shake of the head and a "never mind that, sweetie." She would nod and head over to her room. Today, her father got her a present: a little Kiko plushie with a heart where the bandage should have been. The next day, Sally replaced a plushie from her collection with the Kiko and went about giving breakfast to Mr. Scary as usual. Her mother had prepared some buttermilk pancakes with a healthy dollop of syrup on top. "Mr. Scary," she greeted when they reached the barn. "Mr. Scary, I got some pancakes for you. They're really good, if I say so myself." She put Mr. Scary's plate on the ground, just as she always did, along with her old gray Korbat plushie. She wasn't sure why, but it reminded her exactly of Mr. Scary. She plopped herself down nearby and ate her pancakes just as Mr. Scary was chowing down on his. The cool, fresh air made their warmth all the more noticeable. When she was done, Sally leaned over on an arm and took a look at the front of the barn. The buttermilk pancakes had disappeared, and so had the Korbat plushie. Storm clouds piled in the air, bursting with nascent thunder and lightning. Sally pulled her red scarf over her ears and stood up to meet eye-to-eye with Mr. Scary. "Seems like something's coming," she said. "But I'll be back, Mr. Scary, you bet on that. Mr. Pomiculture paid Sally's family yet another visit. His bumbling pattern of knocks made him easily recognizable before anyone even answered the door. With a sigh, Sally's father came to answer. "Mr. Pomiculture," he said, "what a pleasure to meet you. Would you like to stay a while? We are having dinner soon." At that suggestion, his wife gave vexed look in his general direction. Sally covered her mouth to stifle a giggle. "Thank you for the offer, sir," said Mr. Pomiculture as he entered the house. His big boots left small ovals of mud behind as he walked. "How is your kid doing?" "She's fine. Growing strong, as always." "Yeah, well... listen, I need to talk to you about something real quick. It's not about that Thing, I promise, it's about that other thing." Sally's mother rolled her eyes as the two Neopians retreated to speak about that other thing. She shook her head and gave Sally one plate of rice mixed with beans. "Here," she said, "I'm sorry I can't get anything for Fluffy anymore." After a long slumber, the Thing made a resurgence of sorts around the local farms. It pillaged apples, marrows, and other snatchable crops, but no one really cared. All anyone spoke about were the strange pile of smoke rising above the horizon, the golden orange flames they saw pooling like a terrestrial storm cloud. Or at least, the Darigans did. A "war" implied two fighting sides: two armies clashing. But the castle proper had not sent any sort of army to battle the invading Darigan troops. It was up to the local knights of the duchy to put up a fight, and they were horrendously ineffective. Still, war or not, "Fluffy"--Mr. Scary--was out there, and Sally was as determined as always to feed him. Her mother must have been aware of this, because as soon as Sally started for the door, she was blocked with a yell. "Sally!" she said. "Remember that there's a curfew about. I don't want you going to your imaginary friend and throwing food at him. You're staying right here." She shoveled all her food into her mouth and went to her room, where she plopped herself on her bed. Her plushie collection surrounded her. They lay dull, lifeless, without even the innocent stupidity that distinguished Wooly's eyes. Not only that, they didn't exactly make for good conversation. They never listened to what she had to say, probably because they couldn't listen to what she had to say. And so Sally lay awake, listening to the droning, muffled voices of her father and Mr. Pomiculture. She listened to every footstep, every little creak the wooden floors made. She listened to Mr. Pomiculture's hurried, distressed pacing, the gentle taps of her father's treads on his footstool, and her mother's slow, methodical nightly housecleaning. Her mother's footsteps lingered in the kitchen for a while, then went off to tend to other matters in the storage room. This was Sally's window of opportunity. She took off her shoes, hurried down the stairs, grabbed a few scoops of rice for Mr. Scary, and rushed to the barn. "Mr. Scary," she said. "Come quickly, Mr. Scary! I'll leave this here; sorry I don't come as often... I'll be in trouble if--"
A voice interrupted her, but it did not belong to her mother or father. "Well, well, well, what do we have here?" Sally turned to face a small squad of hulking Darigan soldiers. Directly in front of her stood a Skeith, whose pointed teeth stuck out unevenly when he grinned. "If it isn't a little girl. She'd make a good addition to our stew, wouldn't you think?" Apparently, his joke had only landed with a few of his comrades, because an Eyrie soldier frowned. "Just grab her. We can't risk being seen." Sally didn't hear the Eyrie, however; she had already taken off to the barn itself. She stumbled to the entrance, and, as usual, the silhouette of Mr. Scary emerged from all the other shadows, his eyes twinkling like two distant stars in the twilight. "Mr. Scary! Mr. Scary!" she yelled, banging against the walls of the barn. "They're here! Save yourself--please!" A pair of hands grabbed Sally and hoisted her above somebody's shoulder's. In her confusion, Sally could scarcely notice, instead banging her fists against the Skeith's chainmail. "Mr. Scary! Mr. Scary! Please, save yourself!" The Sketih soldier gave Sally a rough shake. "Listen, if you keep screaming for your stupid imaginary friend like that, girl, I really will--"
Then, with a primal screech uninhibited by faculties such as reason or wisdom, came Mr. Scary. He darted to the soldiers like a flash of lightning, lunging toward the Skeith that carried Sally first. Sally was thrown to the earth among the stalks of wheat. As she staggered on her elbows, Mr. Scary pinned the Skeith down, his eyes narrowed. "D--Darigan?" stuttered the Skeith as he struggled against what was now, very clearly, some sort of Korbat. Mr. Scary gave a hiss in response and turned his attention toward the other soldiers, who had now holstered their swords as a threat. They did not expect that Mr. Scary would ignore their weapons and dispatch them as well. He unleashed a flurry of attacks fueled by basic instinct, supported with memories of fighting tactics that had lain long-dormant. At the conclusion of his fervent assault, he stood over his fallen opponents, arms hanging freely, flailing as though pushed by the wind. The name rang in his head like the caws of a particularly annoying Crokabek. Mr. Scary swatted his claws through the air in an attempt to rid himself of that irritating echo. Then, Sally called to him. "Mr Scary! Mr. Scary... you saved me!" Tears were streaming down the girl's eyes. Mr. Scary stared down at her, feeling a great deal of warmth toward the little green Usul that had protected him for so long. Unimpeded, the name rushed to unlock a myriad of memories in his mind. Mr. Scary--no, not Mr. 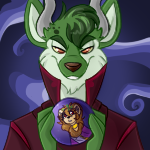 Scary, Lord Darigan--could only muster a small smile at Sally. "Sally..." he trailed off, trying to put the pieces of the last year in his life together with the tumult that was so clearly visible above the horizon. "Sally... I have to go..."
And without another word, he flew away. As it turned out, Sally had to go as well. When she shambled on to the house, both her parents were conversing with Mr. Pomiculture. She barged into their conversation quite literally: in her hurriedness to warn her parents about the Darigan soldiers, she’d careened into her father. “There are Darigan soldiers here! We need to leave!” she yelled. Wordlessly, Sally led them to the barn to see the soldiers for themselves, and that was all the convincing any of them needed. Mr. Pomiculture hurried to the townhouse to spread news of the Darigan presence, and Sally’s family hastily packed together whatever valuables they could carry with them. And as Sally as she fled the village with the rest of the townsfolk, she looked back at her speck of a house nestled in stalks of corn and marrows, and in the horizon, above the smoke and swarms of approaching Darigan troops, she saw a pair of bright stars. They looked like Mr. Scary’s eyes.